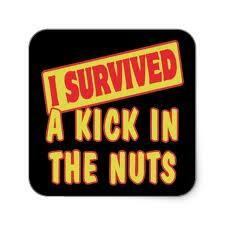 Cosmic Kick in the Nuts – We Got This! It looks like another (relatively) cool morning on-hand here in northern Virginia. I’m taking advantage of this to get Ryan outside for his ActivCycle therapy. It will be nice to enjoy a cup (or five) of coffee while taking in the day. Today looks like the only opportunity for the balance of the week, as temperatures are forecasted in the nineties (one day approaching one-hundred). Ryan’s urinary tract infection seems like it is controlled with the antibiotic. His urine was absent of leukocytes and nitrites last night. Still, we won’t know if the antibiotic will knock it out until we get the urine culture back. Hopefully this will happen today. Even though his urine is clean, it doesn’t necessarily mean the antibiotic (Cipro) will work. It might just suppress the infection if it is a resistant strain, not sensitive to this class of antibiotic. What this means is we might need to change treatment based on the culture results, even though he’s three days in to taking them. Treating urinary tract infections are tricky. There are so many strains of bacteria that can cause infection that determining the proper antibiotic is key. Ryan seems to get them all too. He has one strain, then another, then a third, and so on. If all infections were caused by the same bacterial strain — or even strains sensitive to the same class of antibiotic — we could try putting him on a six to eight week course of medicine in hopes of eradication. Ryan doesn’t fit this profile. We know that each time we have eradicated each strain because in doesn’t return, or doesn’t for many months later. Most who acquire a UTI are given a broad-based antibiotic; one that hits the majority of common infections. It’s no big deal since there is not a great concern to becoming resistant. We must be judicial with the antibiotics we give Ryan. Repeatedly giving a broad-based medicine, with the chronic and recurring nature of Ryan’s infections, would speed along the timeframe for resistance. Basically, in one fell swoop we would make many classes of antibiotics ineffective. This would be disastrous! So, each time Ryan gets a UTI we target the most specific antibiotic to treat it. It’s the reality of the situation. We must guard against doctors and healthcare workers that treat Ryan’s infections like someone without brain injury. Although well-intended, their advice and suggestions rarely include an understanding of the scope of his condition. Sadly, its often short-sighted. They lack the education and experience to make the connection because few rarely treat these people outside the hospital, where their goal (to stabilize and release) is entirely different. It’s just so complex that only a handful of people fully understand what is involved. It’s cross-discipline (e.g., therapeutic, medical, neurological, pharmaceutical, etc). I am one of these people and I curse this universe for being one. It’s a cosmic kick in the nuts. More accurately, it’s like having a testicle squeezed in a vice, where every day it tightens a micron more. Right here waiting for you to post today! Hope the infection is gone — goodbye! Good riddance! Hope you enjoy the near-perfect day (I could do without the sound of cicados eating away at our oak and buzzing all the while!). The good thing is that at least Ryan is more comfortable for the moment, which makes you happy I know! So we will pray that old Cipro did the job! Hi Ken, wow, that last paragraph you wrote — I keep reading it over and over…extremely well said, and should bring home to everyone who reads your blog the magnitude of the stress you and Sue deal with every day — as well as what Ryan fights so hard to overcome. Ultimately, all these enormous decisions seem to rest on your shoulders…and that is so much to bear. But as you have said to us before, this is what we do for those we love. Still, I just have to say that Ryan and Kari are very, very blessed to have you and Sue as their parents. Thank you so much for updating us today, I know how busy you are, and I very much appreciate you taking the time to update us. So glad you and Ryan can get outside and breathe in some fresh air this morning…especially since tomorrow is supposed to be so hot. Thinking of you guys, how can I not, people who demonstrate the kind of love and commitment you do are rather rare…like treasures from another time. We are all very grateful for your extensive breadth and depth of knowledge regarding Ryan’s unique needs. He could be in no better hands, and that’s not just a coincidence. You and Sue are answering the highest calling any parents could have, and with such amazing love and dedication. We pray for provision and perseverance every day, as well as for Ryan’s health and recovery. You Divineys got this! Thank God you have the cross-discipline experience to target the most specific antibiotic treatment. Ryan has a much better chance with you at the helm. Good job Dad. Keep it up! Haha nuts in a vice, thats funny. FREEK AUSTIN!